Intel unveiled a range of new processors aimed at the performance-desktop segment today. For the mainstream market, there are three new K-series overclockable chips branded as ninth-generation parts; seven new Core X-series chips are launching for the high-end desktop market, and for those who need still more performance, there’s an overclockable Xeon chip. The ninth-generation parts confirm previous leaks that hyperthreading is now only found on the top-end i9 processor. That part has eight cores and 16 threads, with a base speed of 3.6GHz and a maximum turbo of 5GHz. This marks the first time that Intel’s mainstream chips have matched the core and thread numbers that AMD offers in its Ryzen line. 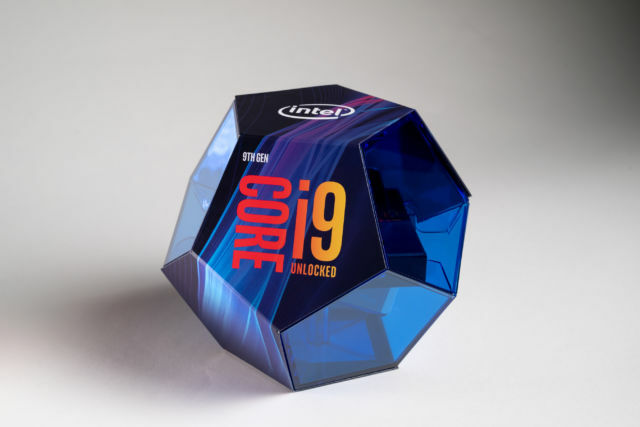 Intel is (credibly) positioning the 9900K to be the best gaming chip in the world, thanks to its strong per-thread performance and high maximum clock speed. In a break with its recent practices, Intel has reverted to using solder instead of thermal paste between the processor die and the integrated heatspreader. This move will be popular among overclockers, as the better thermal conductivity of solder generally enables reduced temperatures and higher overclocking potential. The 9th-generation Core i9 parts will come in a fancy-looking dodecahedron box. All the chips will work on existing 300-series motherboards, and Intel is also introducing a new Z390 chipset. The counterpart to the integrated chips for the Whiskey Lake and Amber Lake mobile processors, the new chipset’s major features are gigabit 802.11ac Wi-Fi and built-in support for 10Gb/s USB 3.1 generation 2. The chips include hardware fixes for the Meltdown and Level 1 Terminal Fault (L1TF) issues, though fixes for Spectre are still software-dependent. For those who need more cores, memory, or PCIe lanes, avail yourselves of a new batch of X-series chips. These use the same Skylake-X core as the current X-series chips but with higher clock speeds. This use of Skylake-X means that these parts don’t include the Meltdown or L1TF hardware fixes. These chips are all overclockable, and they too have a soldered heat spreader. And if this isn’t enough, there’s the Xeon W-3175X. This is a 28-core, 56-thread Xeon with unlocked multipliers for overclocking. This, too, is a Skylake-based part, so again, it lacks the hardware fixes for Meltdown and L1TF. Intel also hasn’t revealed the pricing yet, but we imagine it’s going to be quite expensive. As a Xeon, this part also includes support for ECC memory and uses the C621 chipset. Intel says that certain kinds of content creators want this kind of overclockable chip for their workstations. These markets prefer single-socket systems (they’re quieter, smaller, and avoid the complexities of NUMA, where memory latency and bandwidth vary depending on which core is accessing it) but want the overclockability to eke out extra performance. The ninth-generation processors are available for pre-order today and ship October 19. The X-series parts will arrive in November, while the new Xeon appears in December.